Watch our Sweet Spot Video! One skill we teach at Old City Swim School when preparing swimmers to learn freestyle is the sweet spot. The sweet spot builds on the streamline flutter kick position learned in Level 3. 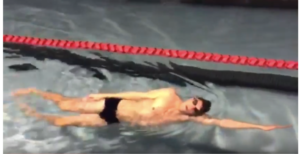 The sweet spot drill allows a swimmer to focus on rolling their body side-to-side while moving across the water. This rotational movement is foundational for eventually learning freestyle with rotational breathing. The upward facing arm on top of the water is placed against the side of the leg. The downward facing arm is in the water extended out overhead in a streamline position. The swimmer uses a traditional flutter kick. Ignore the head position in the video as your student will be taught to look up towards the ceiling and not asked to have their face in the water when learning the sweet spot.